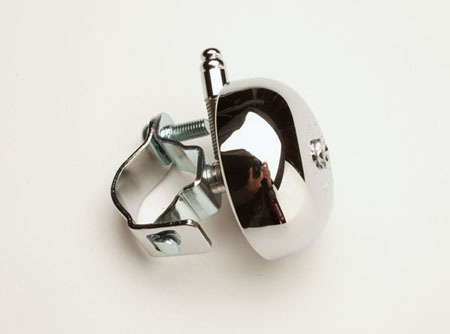 Who would think that a simple bicycle bell could be a source of pleasure. We have two styles of bell, both Japanese. Each is very simple and elegant, making a single ring. The type shown at right is activated by plucking a spring with a striker on the end. It comes with a bracket for handlebar mounting, or it can be mounted directly to a tapped hole in the stem or to a threaded boss. The silver bell is made of aluminum. 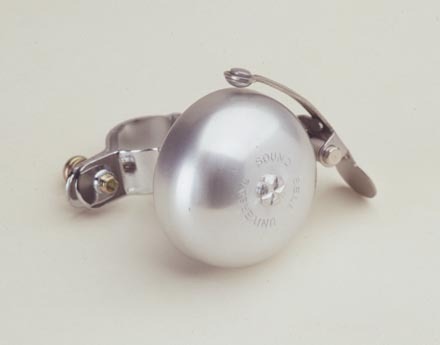 The bell pictured here uses a sprung striker mounted on the outside of the bell. 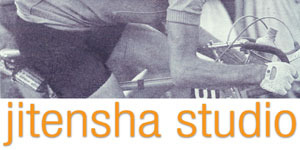 Otherwise, similar to those shown above. 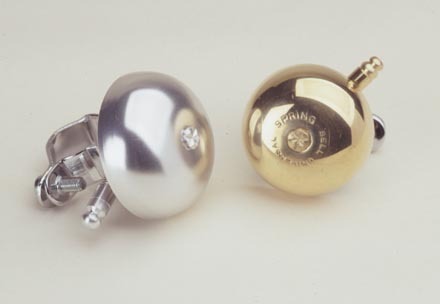 Chrome plated brass bell provides a silver finish with the more robust ring of a brass bell.